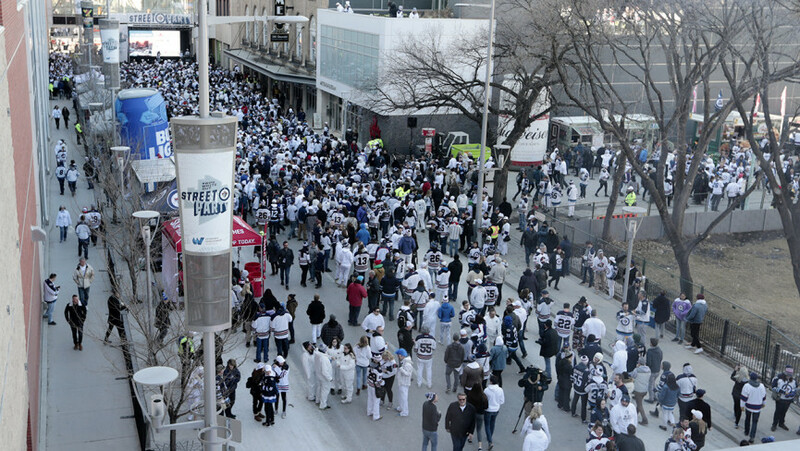 WINNIPEG, MB - It was as dominant of a game as any Winnipeg Jets fan could dream of. 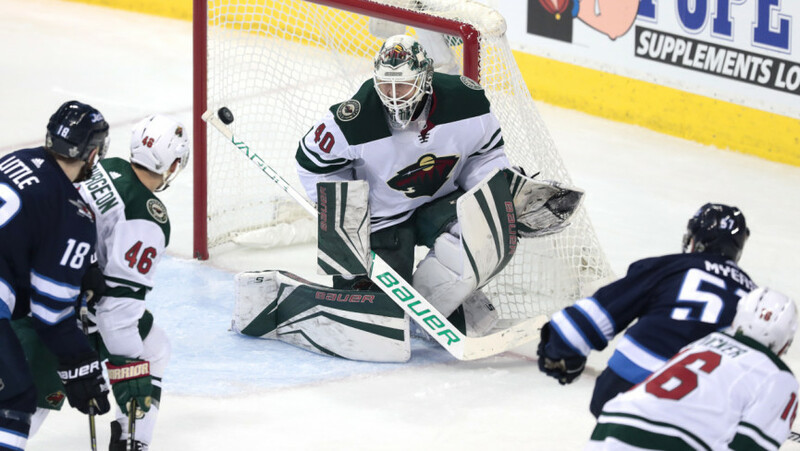 Although once again battling a slow start and a red-hot opposing netminder, the Jets manhandled the visiting Wild, crushing the Americans in nearly every facet of the game, finished atop Minnesota in the shot department 44-17, and ultimately, with a 4-1 victory. Although once again coming out to a bright, tight and boisterous home crowd, neither the Jets or Wild could build off of the jam-packed arena, with both Central Division teams failing to score in the opening 20 minutes of game two. Minnesota actually recorded the game’s first five shots on goal – due in a large part to a rather interesting Tyler Myers tripping penalty just four minutes into the contest. The Wild only put up four shots in the remaining 15 minutes of the period. Winnipeg’s attack seemed to run in spurts, with a handful of chances coming every two or three minutes. Minnesota’s game one hero, netminder Devan Dubnyk, seemingly picked up where he left off on Wednesday, stopping all 13 pucks he faced in the first period. Minnesota’s Mat Dumba, Head Coach Bruce Boudreau’s chosen replacement for injured defensive stalemate Ryan Suter, spent an astonishing 9:35 on the ice in the opening frame for the visitors – a benchmark just shy of two minutes more than the Jets’ icetime leader, Ben Chiarot. Winnipeg’s Mathieu Perreault – who missed the second half of Wednesday’s series opener after finding himself on the receiving end of many thunderous body checks – did not dress for the Jets, as rookie Jack Roslovic took his place in the lineup alongside Bryan Little and Joel Armia on Winnipeg’s third line. Friday’s second period very well may have been the most lopsided 20 minutes of hockey that either the Winnipeg Jets or the Minnesota Wild have experienced all season. With shot after shot, opportunity after opportunity, the Jets continued to pour on the offence, for the duration of minutes 21 through 40. Midway through the game, former Calder Trophy winner, defenceman Tyler Myers walked around Minny’s Jason Zucker, before shifting his way directly to the Wild cage, and burying a quick snapshot past the near-unbeatable Devan Dubnyk. The goal – Myers’ first of the playoffs – brought the Winnipeg crowd to its collective feet, and remained the difference in the game – for the foreseeable future. Winnipeg finished the second period with a Corsi-for rating of 81 percent – an unprecedented mark worthy of a seat in the fancy stats Hall of Fame. The Jets held a 22-5 advantage in five-on-five shot attempts after two periods of work. Putting up 14 shots in the middle frame – as compared to Minnesota’s five – Winnipeg increased its lead to 27-14 heading into the third period of play. Finally, the tides seemed to change as Winnipeg was able to put some pucks past Minnesota’s last line of defence. After a strong offensive shift, Dustin Byfuglien perfectly centred a pass to Paul Stastny, who made no mistake pounding in his first playoff goal as a Winnipeg Jet, and the 15th of his career, with 12:18 to go in the third period. Less than two minutes later, Andrew Copp redirected another puck past a severely overworked Devan Dubnyk. Picking up his second assist of the game on Copp’s first was the aforementioned Jack Roslovic, who drew back into the Jets’ lineup following an injury to Mathieu Perreault in game one. Copp’s goal came on Winnipeg’s 35th shot of the game. Adding insult to injury, Patrik Laine added to the Jets’ lead with 2:02 to go, bringing the Jets’ goal total up to four on the evening. 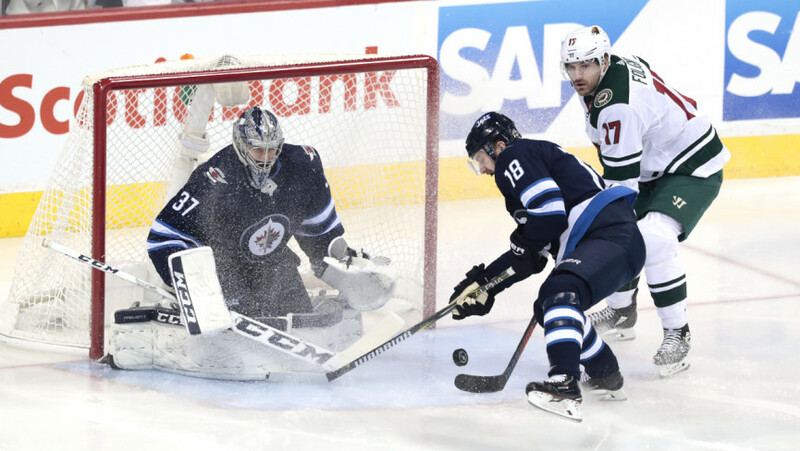 With the Minnesota net empty and the Wild on a six-on-four man-advantage, Zach Parise redirected a point shot into Winnipege’s net, ruining Connor Hellebuyck’s bid for his first career playoff shutout. The fists began to fly in the final ten seconds of the game, but little could be done to curb the damage already done by Winnipeg. Minnesota’s first bit of ‘fight’ in the series came with 10 seconds to play in the third period of game two. It came in the form of 34 penalty minutes. The Jets’ fight came in the form of 44 shots on net – resulting in four goals and a 2-0 series lead. 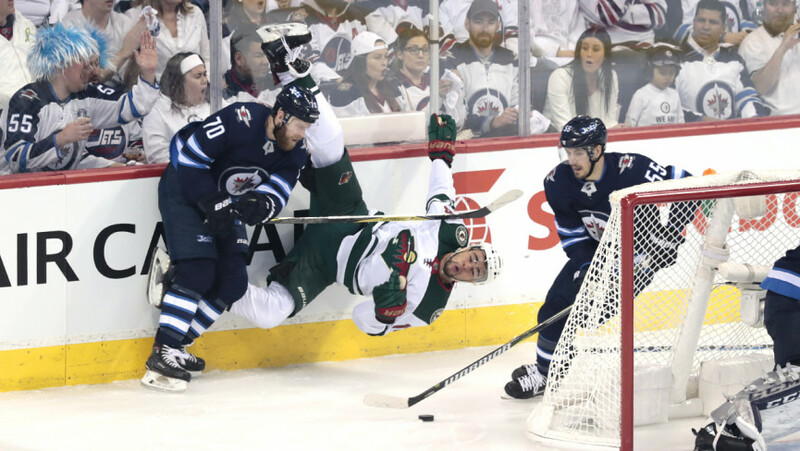 Winnipeg will now take their show on the road as the series shifts to Minnesota for games three and four, to be played Sunday and Tuesday at the Xcel Energy Center in St. Paul, Minnesota. Puckdrop is set for 6:00 P.M. central time on Sunday, while Tuesday’s game will get underway at 7:00 P.M. central, also found on Sportsnet.